Is your luxury home due for a remodeling project, but you’re not sure what to include? Let’s explore some ideas that can help you have your dream home in Phoenix, Arizona. First, lighting. Modern and decorative lighting fixtures can really add some personality to the interior of your home. For instance, there are countless designer table lamps and hanging light fixtures available, ranging from minimalist to intricate, to suit your tastes. Another great product to include on your luxury home remodeling project in Phoenix, AZ, is crown moulding. This decorative fixture provides an elegant architectural flair where your walls reach your ceiling. Crown moulding is usually made of wood, is available in a range of colors or stains, and comes in a number of unique designs to enhance the look of any room. You may want to also consider updating your kitchen’s appliances. Technology has come a long way with kitchen appliances and there are a lot of different styles of elegant ranges and refrigerators to choose from, with all kinds of bells and whistles to make preparing meals easier. In addition to traditional appliances, there are also wine preservation units, warming drawers, built-in coffee systems, and other modern fixtures available. If you’re a homeowner in the Phoenix, AZ, area and are embarking on a luxury home remodeling project, turn to the experts at Premier Kitchen & Bath. Our professional designers will sit down with you in our showroom to discuss what’s possible for your luxury remodel. Next, after taking precise measurements at your home, we’ll provide a 3D rendering of what your remodeled space will look like, and will incorporate any revisions you may have. And finally, when the time comes to complete the renovation, we’ll ensure your complete satisfaction with the installation and will include a five-year warranty to protect your investment. 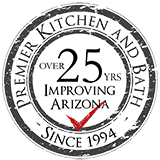 To speak with one of our specialists about your luxury home remodeling project, contact Premier Kitchen & Bath today.